The benefits of server virtualization are compelling and are driving the transition to large scale virtual server deployments. From cost savings recognized through server consolidation or business flexibility and agility inherent in private and public cloud architectures, virtualization technologies are rapidly becoming a cornerstone of the modern data center. So how can you take full advantage of virtualization while continuing to meet all your data management and protection requirements? Surprisingly, it’s not as daunting a task as you would think….that is, if you have a virtualization blueprint for success at your fingertips. 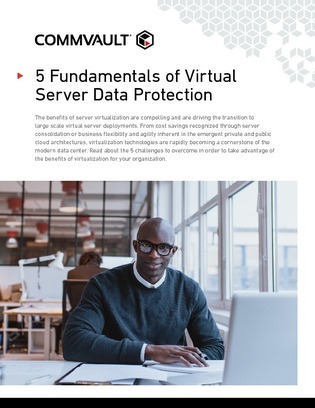 Download and discover how to achieve server-virtualization nirvana without sacrificing security as we reveal the top five fundamentals for virtual server protection.